I awoke with one of my last first breaths in Iceland. I reached my hands towards the bunk above me, I yawned, I took another breath. I started contemplating each breath, wondering which would be the last one here in Iceland, wondering if it was even worth it to count, as an effort to remember how many times I had breathed in the fresh Icelandic mountain air. I figured that the more I would breathe in the more my lungs would remember. I was leaving in two days. How could I not want to store as much as possible into the memory of my form? Day 5 on the Laugavegur trail. The last hike, the largest hike. 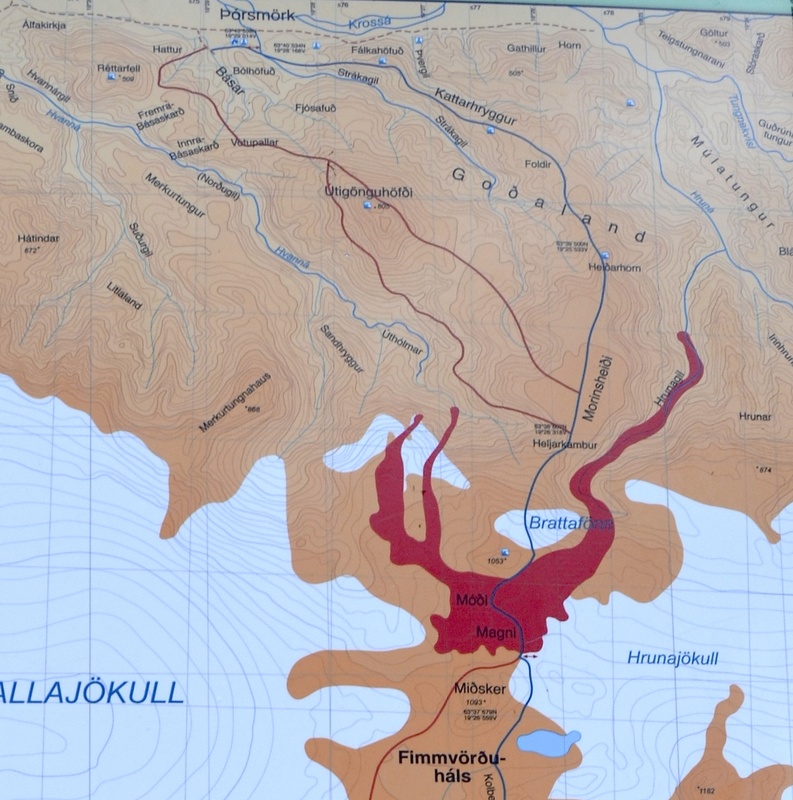 Today we were going to climb to the Fimmvorðuháls pass, the path between the two adjoining glaciers Mýrdalsjökull and Eyjafjallajökull, which had been our guiding end posts since the beginning of the trail. It was strange to think that after so many days watching these two giant glaciers peeking out behind the mountains, we were finally going to set foot on them. They seemed unreal, as if they had been mirages the whole time, allusions of the mind to keep us moving along the trail, to induce a sense of hope at an end goal. We were going to climb them. Ah, we were going to climb them. Eyjafjallajökull was a national phenomena, having erupted less than four years ago in April of 2010. This mountain was alive, it was breathing hot air on the inside. Everything was becoming more and more real as I tied my shoes and pressed my feet into the moist ground once more. As of the day before, our numbers had dwindled until only half of the group was left. This had been sliced and reduced to even less than so, as some of our trek mates hiked around the huts at þórsmörk instead. 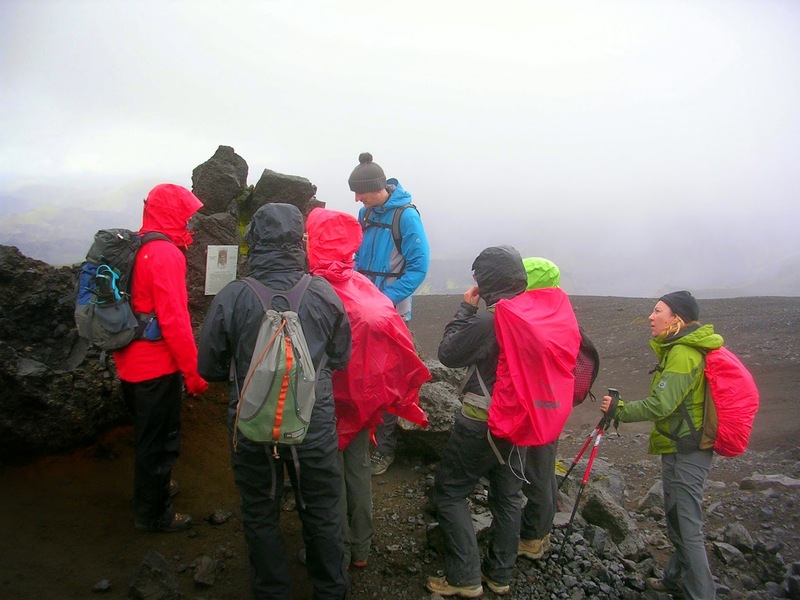 Eight of us set off, making the long trek from the hut Básar at þórsmörk to Fimmvorðuháls at the sites of the volcanos Móði and Magni, an intense and dangerous path of scaling mountainsides and trudging through snow and a volcanic wonderland. We began in a lush green canopy of birch trees, peeling bark lining the sides of the path as we scraped our muddy boots along the trail. Today was unlike the rest of the trip, it was a salt-shaking of sprinkled rain dotting the tops of our hats in speckles. The fog far outreached our swaying hands, lying over the peak of the glaciers like the most intentionally covered furniture. The petrichor was strong on the trail, it made the moss pleasant to walk alongside (not that it wasn’t already pleasing to accompany). Svavar, our guide, picked blueberries along the way from the bushes near our feet, crowberries were crushed between the teeth. We climbed, and climbed, and climbed, flora silently making a spectacle of our attempt. Once we reached a high enough peak to look over into the valleys below us, we were able to see the giant carvings of the glacier river. Black tarmacs of flowing water etched themselves out of the earth like an etch-a-sketch on a mad dash to express its purpose. The skies grew even closer to us, My hands could all but grasp the overhanging, melancholy clouds. As the terrain changed, the trail thinned. The path up the mountain was letting go of the parts of itself it didn’t need; foliage, stability, grace, all gone. It was becoming more vulnerable, more honest. It had shed its green to uncover a harsh under-layer. But the moss persisted, just like we persisted as we sought to cover it with our footprints. 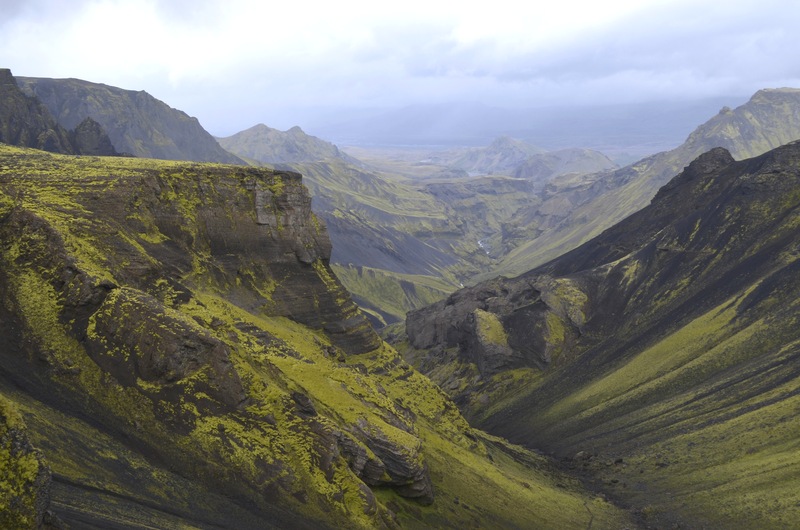 Well, for those of you who hadn’t known, Iceland has a long past associated with the belief in elves (called Huldufólk, or “hidden people”) and trolls, which turn into stone by daylight. The theory is, if they don’t get to their caves before the sun comes up over the horizon, they immediately take on a statue-like form, forever frozen into the landscape. 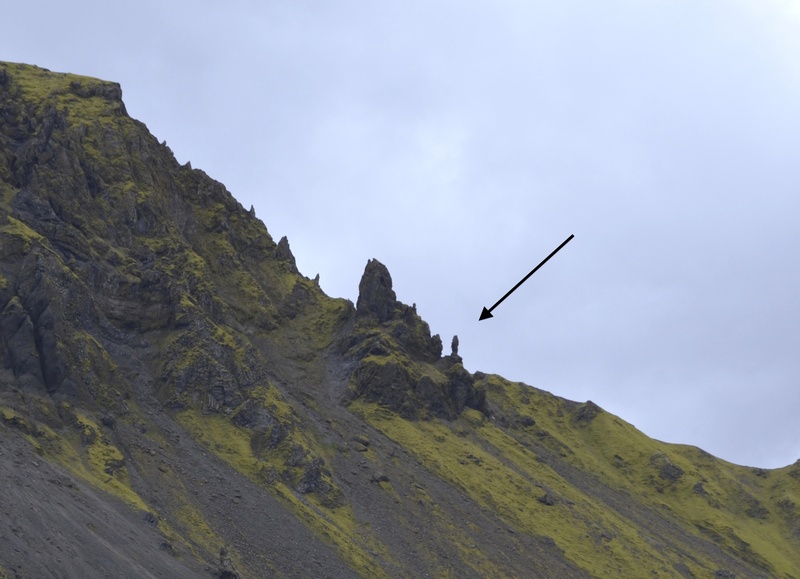 Some even claim that entire mountains resemble giant trolls. In the Westfjords, one of the most remote parts of Iceland, it is believed that a troll created small islands off the coasts of the fjords by digging into the mountain and throwing pieces of it into the sea. One might find this silly and a bit maniacal, but if you end up in the Icelandic wilderness alone for too long, it isn’t difficult to start seeing things that aren’t seemingly there. In fact, on a bus ride to the town of Ísafjörður a few weeks before the hike, I stumbled upon a strangely convincing site. On the side of the mountain in the distance sat these giant sheep, geometric-like and such, and I saw them resting intently like sheep…wait, they couldn’t have been sheep. They weren’t moving, they looked so harshly outlined. But then they did move, or perhaps the shadows moved, I saw limbs, maybe a figure curled over. It took a moment for me to realize that these things really were boulders, fallen from the mountain above. I thought, if I could consciously assume these rock formations were alive and breathing in the most human-like sense, then so could Icelanders over the past few centuries. I was amazed by the similarities to the human figure that these formations possessed. A few chuckles rang out from the group at the site of this “backpacker” frozen at the top of the mountain. I stood in a sort of awe, realizing that the landscape had more life to it than one could ever imagine. Our cerebellums came into play more and more as we focused on balancing through the terrain. One endeavor to reach the top involved the use of chains that we had to grasp onto. They were held in place by long metal poles that were drilled into the rock. The only thing was, these poles were wobbly and unstable, which made the prospect of falling quite terrifying. 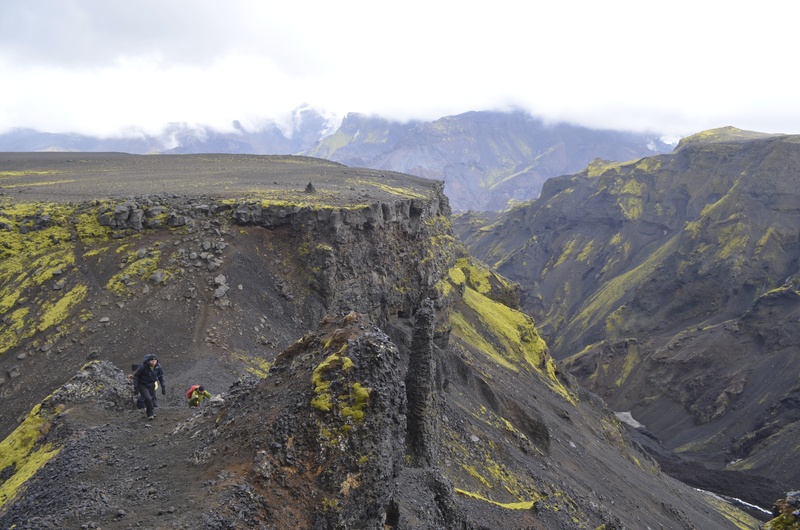 Lory, a member of our expedition, experienced a strong sense of vertigo during these moments which made our steps even more careful as we all felt the anxiety settling in. I felt like the rock would fall beneath me like the crumbling of a burnt candle wick, but luckily the mountain had practice with this one, and persisted despite our weight. Once past the most structurally unsound parts of the path, we were able to look at the new land forming below and around us. Evidently effected by the most recent volcanic eruptions a few years ago, the landscape was covered in an ashy black. It streaked in muddy browns and grays down the side of the mountain like rain pooling and cascading down the debris on a dirty car window. What was interesting was the moss that had attempted to reclaim the landscape. It seemed to have crawled right through the pores of the volcanic wasteland, making its presence known in lush, tennis ball greens and dirty golden, hazy browns. I had never before seen a color combination so present and juxtaposed before. It seemed to fit together like a complimentary color duo, yet so oddly out of place and uninvited. And the more we climbed, the sooner our forest green grasses turned to neon mosses, the sooner the neon mosses turned to muddied patches of volcanic rock with little to no life left inside of them. We were about to enter a land of monochrome, but we didn’t know it yet. The fog was prevailing over the tops of the two glaciers, obstructing our end goal and also sending godlike forces of wind and rain at our faces. At one point I tripped and fell, cutting open my hand on an inconveniently muddy, porous rock, and the wind licked at it until my fingers were stinging. Strangely the pain felt good, I felt more directly than ever the strong forces of the earth effecting my body. We all must have looked like a silly bunch, covered head to toe in rain gear, bright red ponchos and wind stricken faces. The air was getting colder and we had finally entered the heart of the fog. We crossed the barrier between this world and the next. 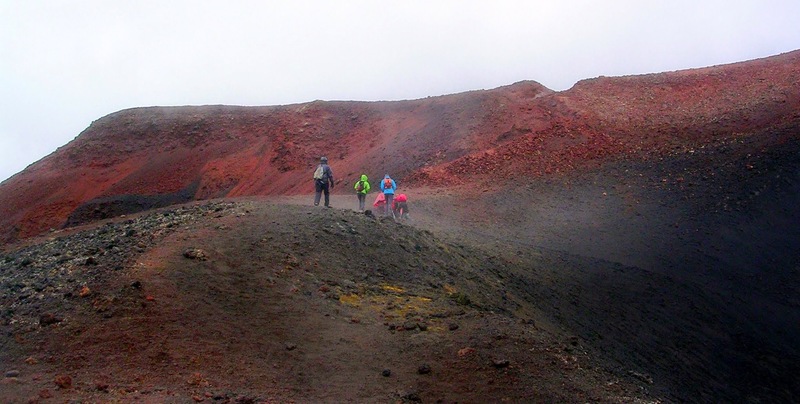 With red faces we entered a monochrome realm consisting of volcanic waves and unbroken white snow. Not a speckle of green was to be found, not a single notion of life left before us. In the distance, two giant black mounds rose from above the fog. 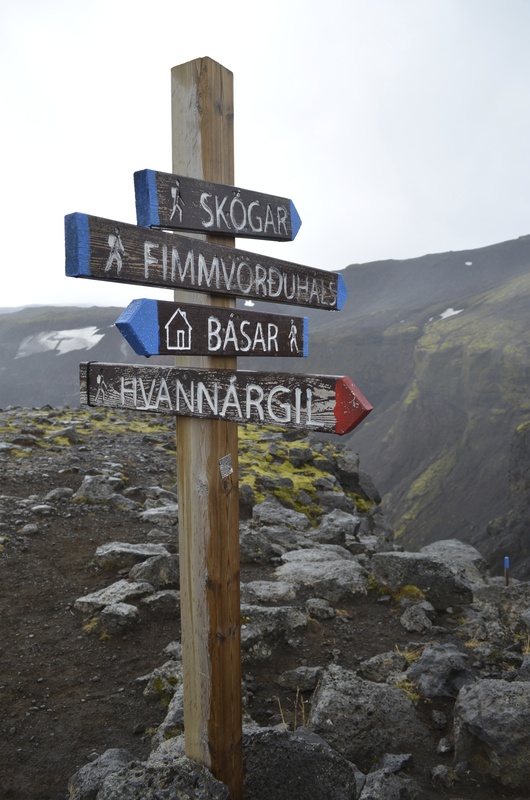 We had reached the beginning of the Fimmvorðuháls pass. 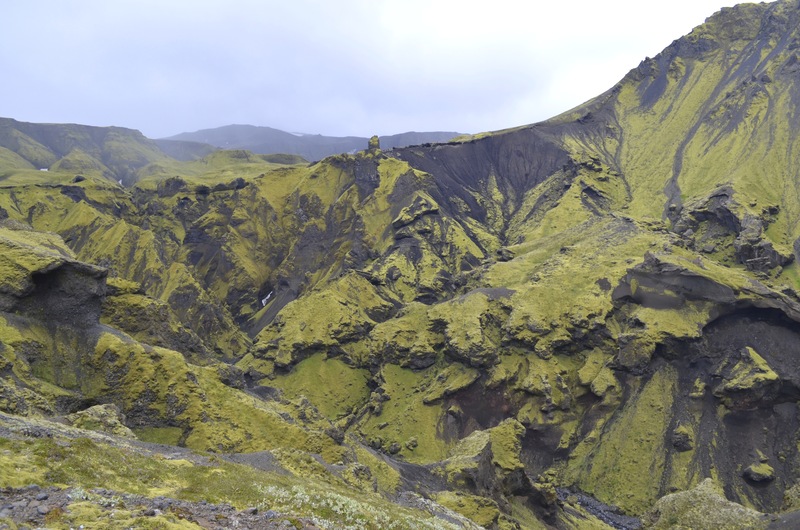 These giant black mounds were Móði and Magni, two volcanos that recently erupted previous to the Eyjafjallajökull eruption in 2010. These mountains were like children, we were walking on fresh land. 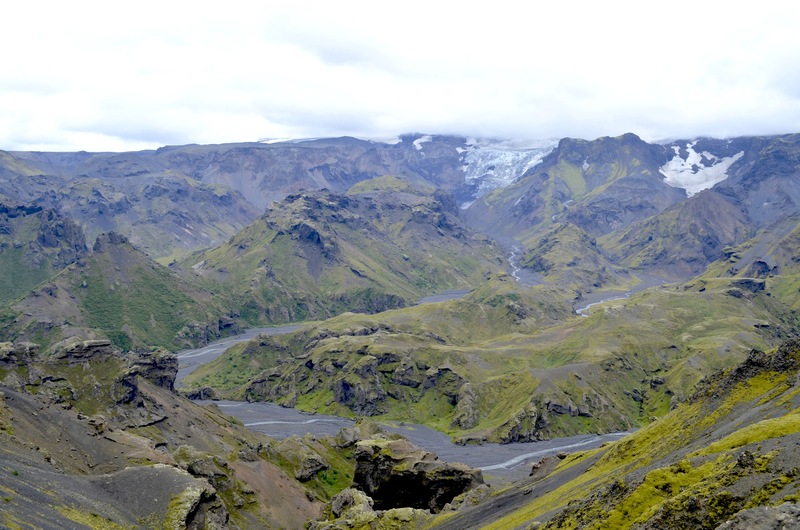 For a little history into the naming of these two mountains, I’d like to mention that Móði and Magni are the sons of Thor (the supreme Old Norse god). Knowing this made walking among them even more ethereal and lively. As we climbed through the snow, the temperature dropped and the fog fell even more aggressively than before. 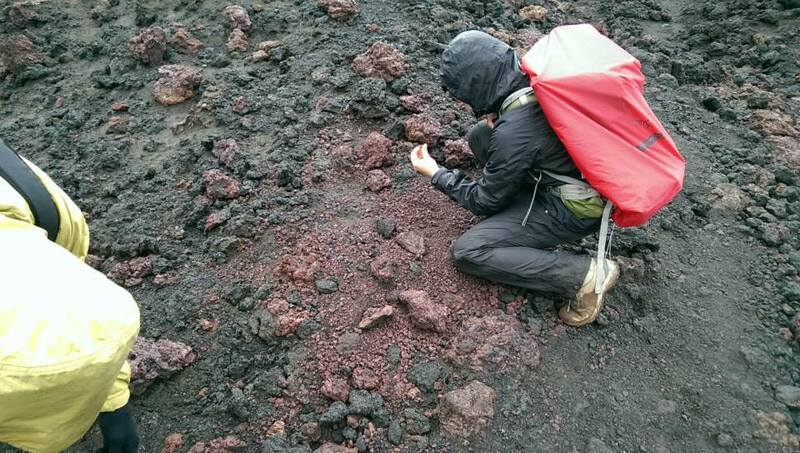 My cheeks felt red, and somehow the mounds of volcanic rock mirrored that and became red too. Yes, the rocks, they were changing color! Out of the corner of my eye I could see pink patches, lavender, a little orange. Upon closer inspection, I realized that the rocks really were vibrantly colored, as if the lava hadn’t yet cooled. 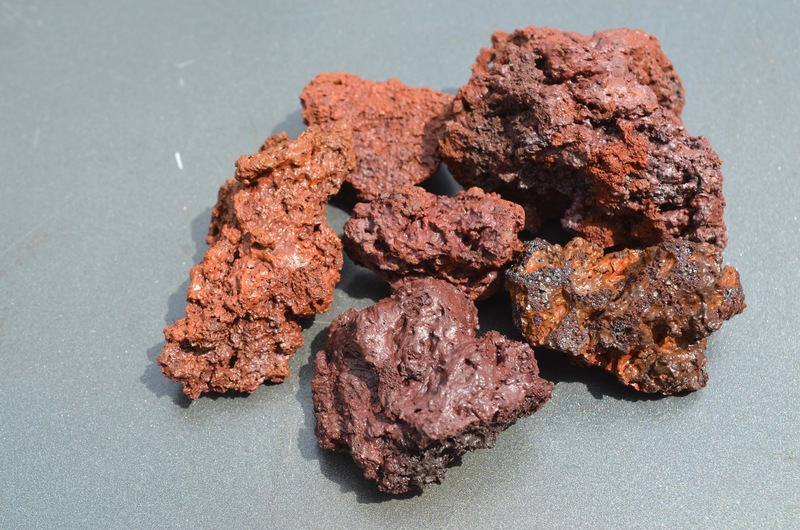 The texture of them indicated movement, there were air bubbles strewn about within them, swirls where the lava settled. I was in a fleshy, iridescent wonderland. I couldn’t have foreseen this less than five minutes ago, every indication led to less color and more of a hazy black. But this, this was extraordinary. The changing colors of the rocks reminded me of the swirling of hues in a soap bubble. The closer we got to the top of the volcano, the more rugged and crimson the landscape became. 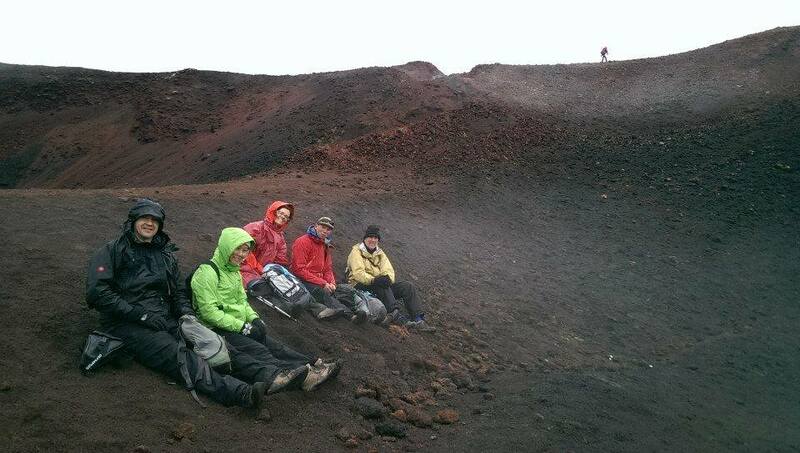 When we reached the point where the small crater showed itself, Svavar told us to sit down and feel the temperature of the ground. We pressed our hands to the sharp earth and a wave of warmth ran through our arms. I pulled my hand back and my entire palm was filled with red smudgy powder. Immediately Svavar sat on the ground, and the rest of the group followed. It didn’t matter anymore that our faces were being eaten alive by the wind and the rain. because we had found comfort in the warmth of the earth. I felt like I was sitting on a hot plate that had just started warming up, and the longer I sat on it, the warmer my entire body felt. I could feel waves of dull heat working their way through my legs, up my chest, to my face. 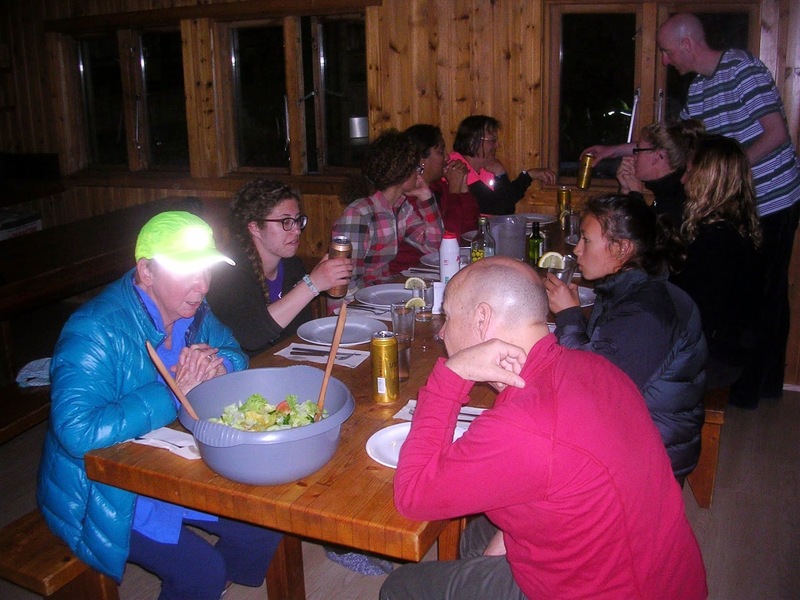 I was glowing, the rocks were glowing, the smiling faces of Allan, Morgan, Peter, Svavar, Lory, Judit, Dave, all glowing. Since there was still some terrain left to climb to get to the very top of the volcano, I set out alone to explore. The rock became like scree beneath me, and I found myself scrambling in pure red, scraping my hands as I grasped onto rocks. I couldn’t tell if my hands were bleeding or they were just full of powdered rock, the red smeared across my palms like bright blood. The mountain was leaking all over the place, my shoes were bright maroon, hands red, fingers tinged a little golden from some of the various yellow rocks amid the crimson. I stood at the top of this peak and looked around at my surroundings. Black, volcanic rolling meadows, snow topped, fog laced, misty. I stood here for many moments, feeling like I was witnessing an ocean, once frozen in anger and now approaching a snowy calm. The way to the pass was one of hard laborious climbing and dedication, while our descent became one of exploration of that which we had passed up. The group trudged along the snowily landscape once again, but a little more distanced this time. 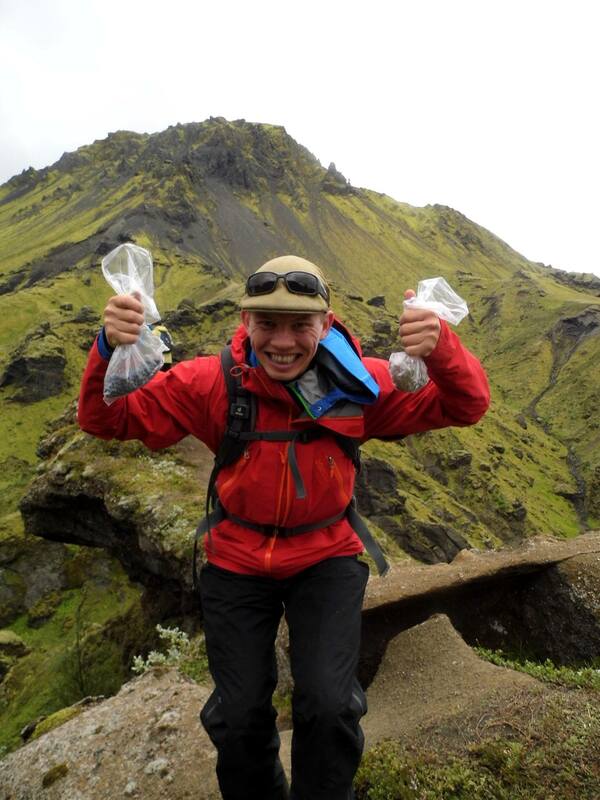 Allan was falling behind in the back, picking up rocks and feeling them within his hands. 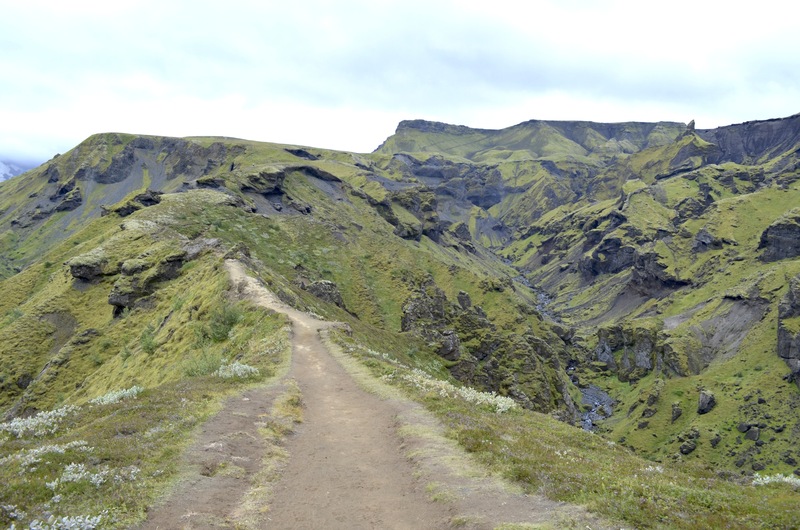 The way he looked at each one was a notion of awe, a manifestation of “wow, this is all too beautiful.” Dave was between us, pointing out giant chunks that he considered bringing back to his wife Peggy, who decided to stay in Þórsmörk. I was shuffling the red rocks around with my hands, choosing the ones I was most drawn to, hiding them away quietly into my pocket. One of us would hold up a rock and the others would circle around it to examine it, in awe and fascination of its existence. It was becoming colder again, but I hadn’t wanted to leave. 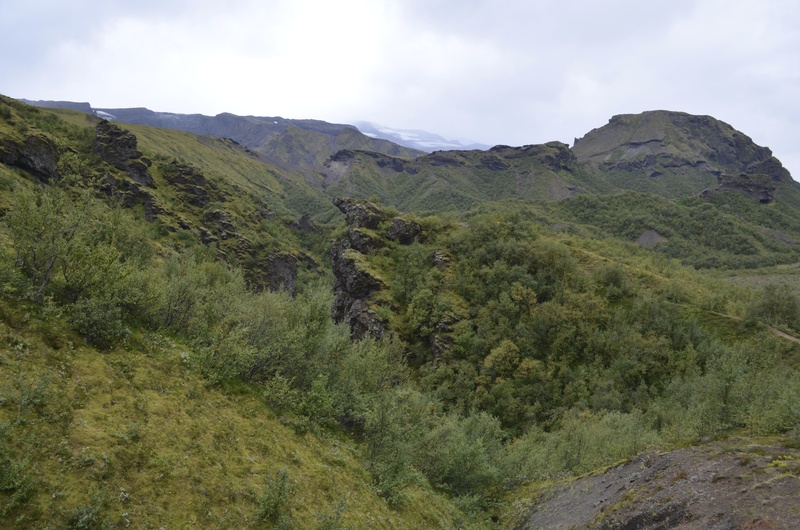 Further and further back to Þórsmörk we went, descending from crimson warmth to black ash, monochrome to neon green, moss to berry bushes. Life grew around us again at a rapid speed. Svavar stopped in front of a canyon-like enclosure and told us to hush. He let out a loud whoop with his hands cupped around his face, and then fell silent. But his voice carried on, it bounced off one side of the mountain, fell to the next, then crumbled along the side of another, then fell to the bottom. He had produced a synchronized chain of echoes, four to six loud shouts into the earth! This made me think of the Icelandic word for echo, “bergmál” which is a compound of “berg” and “mál” which translates to “rock face language.” Enthusiastically, we asked him to do it again, and so he did it again, and again, and we could have listened to a voice bouncing off a mountainside for hours. But Svavar had other intentions. He was stopping here and there on the trails to pick blueberries, an endeavor that required a good eye and a quick hand (Everyone was after these berries after awhile, and no bush was safe). Avoiding the more tart, darker crowberries, it was a mad dash for the blue berries, and we collected them with little sandwich bags we had been recycling along the hike. For every blueberry picked, about two went straight into my mouth. The whole mountainside was littered with them, and we were collecting them so Svavar could add them into our dinner for that night, leg of lamb. When we got back, stories of the hikes were exchanged between the groups while we awaited Svavar’s authentic Icelandic leg of lamb cooking. The dinner proved to be excellent, and we all toasted to the small family we had gained over the past week of hiking. It was coming closely to an end. One more day and our lives would ultimately fall out of place with each other, and we would go about the world knowing we had bonded with each other through the extravagance of the Icelandic landscape. 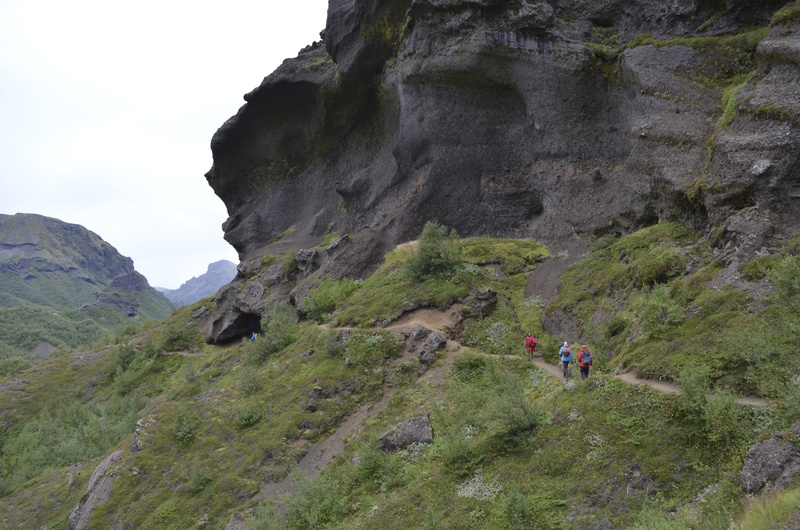 This entry was posted in Laugavegurinn Trail and tagged Þórsmörk, berry picking, Eyjafjallajökull, Fimmvorðuháls, Hiking, Laugavegur Trail, mountains, South Iceland, trolls, volcanos. Bookmark the permalink.